Nigeria is the largest oil exporting country in Africa and has a rapidly growing economy. The country follows a resource based growth strategy driven by the production and exporting of oil. 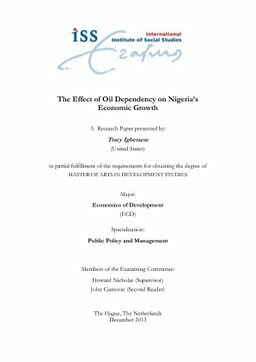 With the volatility of global oil prices and of-ten volatile growth of Nigeria’s economy, this research is designed to examine the effect of Nigeria’s oil dependency on economic growth. This research at-tempts to answer the question of if the volatility of global oil prices is directly linked with the volatility of economic growth in Nigeria and uses GDP as the key variable for economic growth. An exploratory data analysis is employed using secondary data to examine the relationship between oil and GDP and the effect it has had on Nigeria’s growth since 1961. The research found that there is a significant and positive relationship between oil dependency and economic growth in Nigeria. In the short-run, Nigeria was able to have increasing, yet volatile growth because of the high global oil prices, but in the long-run, the inconsistency of oil prices and lack of diversification of the productive base has had a negative effect on Nigeria’s economic growth. Thus, the research suggests that global oil prices are the cause of Nigeria’s volatile growth rate. A combination of strict fiscal policy focused on the actual implementation of development and diversification and industrialization might be effective to protect the country’s economic from further global shocks and lead to increased and consistent economic growth.